This post is sponsored by Olivieri. Do you have any big plans for dinner yet? I posted a romantic pasta recipe a few weeks ago, but today I thought I’d share something more kid-friendly. After all, kids love Valentine’s Day too! 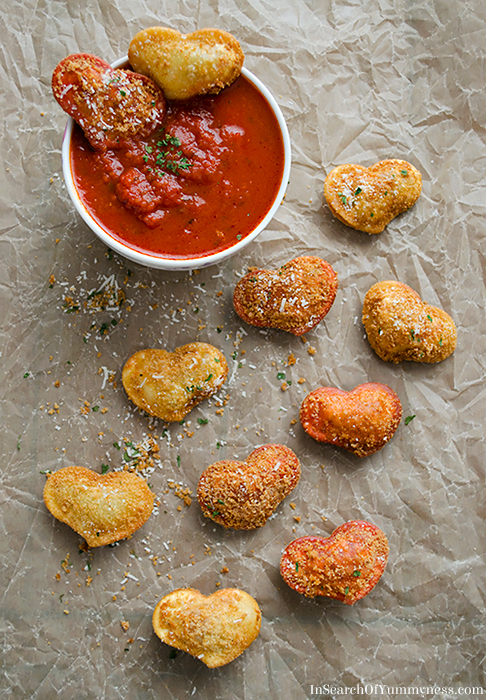 I’m sure that most kids would love these fried ravioli hearts. They are cute, crunchy and easy to pick up with your fingers. They are also super easy to make. I breaded these heart-shaped ravioli from Olivieri and then dunked them into hot oil until they became crispy. Once they’ve cooled off a bit, you can serve them with warm Marinara sauce. Yum! 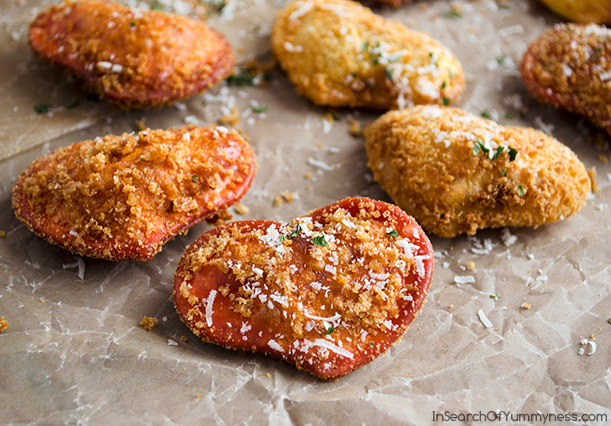 These fried ravioli bites are cheesy and delicious, and they reheat well too. Imagine a bowl of these sitting on the table at a casual dinner or a kid’s party – cute right? The kids can even help out by dunking the ravioli pieces in the buttermilk, and sprinkling the cheese on top at the end. Getting them involved not only makes them feel accomplished, but they are more inclined to eat food that they’ve helped prepare (true story!). It’s important to get an even coating of crumbs on each piece, so take your time with this. I’ve included a video below with step-by-step visual instructions, just to make things easier for you. You can also print the recipe below for easy reference. Pour grapeseed oil into a large frying pan or dutch oven until you reach a depth of about 2 inches. Place the pan over medium heat, and insert a food thermometer (if you have one). The oil needs to heat up to 325 degrees F.
In a shallow bowl, combine the breadcrumbs, oregano, salt and pepper. Pour the buttermilk into a separate shallow bowl. Set a baking sheet next to your bowls. Working one piece at a time, dip the ravioli into the buttermilk. Once you have completely coated the ravioli, allow the excess buttermilk to drip off. Dredge the ravioli in the bread crumbs, making sure to get an even coating. Then place the ravioli on the baking sheet, and continue breading the remaining ravioli pieces. When the oil is hot, begin to fry the ravioli in batches, starting with the pieces you breaded first. Once you start frying, be sure to turn the pieces over occasionally to ensure even cooking. After 3-4 minutes the ravioli will turn a deep golden brown colour. Use a slotted spoon to transfer the fried ravioli to a plate with paper towels, and allow them to drain. To serve, sprinkle the hot ravioli with Parmesan cheese and dried parsley. 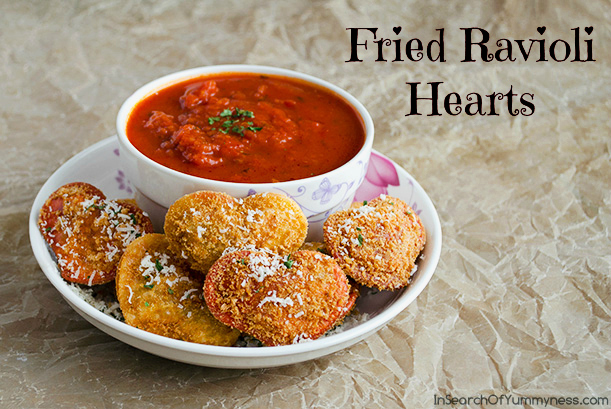 These fried bites go really well with warmed marinara sauce for dipping. I found the ravioli hearts at Metro grocery store. Olivieri is still accepting entires into their Spa Retreat contest. Click here for your chance to win a Spa Retreat from Olivieri. For more #Recipes4Romance, be sure to follow Olivieri on Twitter. This post, but not the video, is sponsored by Olivieri. I am not affiliated with the Olivieri spa giveaway. Never in a million years would I have thought to fry ravioli. Those look super yummy. Awesome idea! Honestly, it seems really weird at first! But they are super yummy, I hope you try them! WHAT YOU MET GIADA?! So cool. These look super cute and delicious, Shareba! And I love the video. GIRL YOU SO PROFESSIONALLLLLL. And you should be a hand model. Ahaha, thank you so much Lisa! And yes, I did get to meet her briefly. I’ll have details in a blog post soon!